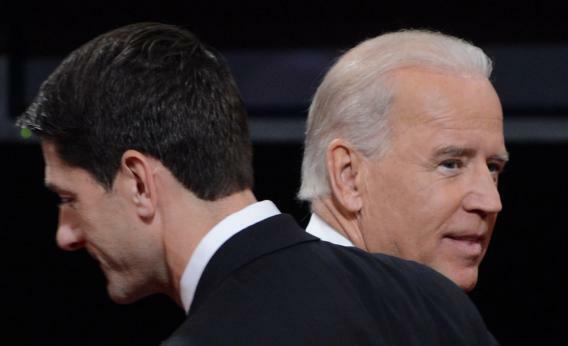 Biden-Ryan debate: On defense and foreign policy, Democrats and Republicans switch sides. On defense and foreign policy, Democrats talk like conservatives, and Republicans talk like liberals. Here’s what we learned from last night’s vice-presidential debate. On domestic policy, Mitt Romney and Paul Ryan stand for self-sufficiency, compromise, and reducing the government’s rate of growth. Barack Obama and Joe Biden stand for generosity, firmness, and maintaining projected spending. On foreign and defense policy, it’s exactly the opposite. Obama and Biden stand for self-sufficiency, compromise, and cutting back budgetary increases. Romney and Ryan stand for generosity, firmness, and higher spending growth. Let’s take the major disputes one by one. 1. Welfare. Republicans believe in personal responsibility. That’s what Ryan said last night: “We want to get people out of poverty, in the middle class, onto lives of self-sufficiency.” Romney made the same point in last week’s presidential debate. He faulted Obama for putting more Americans on food stamps. We immediately went out and rescued General Motors. … Romney said, “No, let Detroit go bankrupt.” We moved in and helped people refinance their homes. Gov. Romney said, “No, let foreclosures hit the bottom.” But it shouldn’t be surprising for a guy who says 47 percent of the American people are unwilling to take responsibility for their own lives. … He’s talking about my mother and father. And he’s talking about the places I grew up in, my neighbors in Scranton and Claymont. But when the discussion turned to foreign policy, the candidates traded places again. Three times, Ryan accused the administration of letting Russia “water down” international sanctions against Iran. He demanded tougher sanctions advocated by congressional Republicans. Biden replied that firmness had to be sacrificed for the sake of consensus: “Imagine had we let the Republican Congress work out the sanctions. You think there’s any possibility the entire world would have joined us—Russia and China?” That’s how you get things done, Biden implied: by working with other countries to fill in the details. If you watched the debate to find out where the candidates stand on specific issues, the exchange was informative. Biden and Ryan pressed and rebutted each other aggressively. But if you hoped to find out which ticket shares your values, good luck. You can vote for the party of self-sufficiency, flexibility, and slower spending growth, or you can vote for the party of compassion, clarity, and sustained financial commitments. But first you’ll have to decide whether you want those principles at home or abroad.